Christine Lindsay, Writer and Motivational Speaker: SHE WAS WEARING AN EYE-PATCH !!! This week, COTT is featuring a Clash of Leading Ladies. But just how are interesting characters born? Here's one author's experience. Welcome Carol Moncado. The weekend before Easter, I was diagnosed with Bell's Palsy - where half your face just stops working. Fun. Not really, but it's great story fodder. That's me. The story is one I started recently. It might have been what drew my attention to her, but it wasn't what kept it. She stood there, singing along with the praise and worship band, her hands raised. Worshiping her Maker with abandon. But only half of her face worked. The whole thing lit up but only half of it moved. 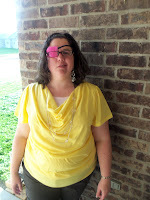 The half with the eye patch seemed to be paralyzed, but it didn't bother her.A pink eye patch. Now, to be fair, the heroine is younger, skinnier, with darker, straighter hair than me, but that's where the idea for her came from. But Travis won't see his name in print. A week ago, he was in a car accident. At age 22, he left this life - leaving behind the love of his life and two children. 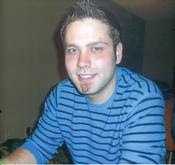 I'm deeply saddened by news of Travis' passing. To me he was more than 'just' a shift manager at the Panera I frequent. He was a nice guy I loved to chat with. Another manuscript I planned to work on is about a widow. That's all I knew until last week. Now, she's a widow with young children a few years after a senseless tragedy. When she's not writing about her imaginary friends,Carol Moncado is hanging out with her husband and four kids in the big yard of her southwest Missouri home, teaching American Government at a community college, reading, or watching NCIS. You can follow her ramblings on her blog . **Be sure to head over to Clash of the Titles and cast your vote today!